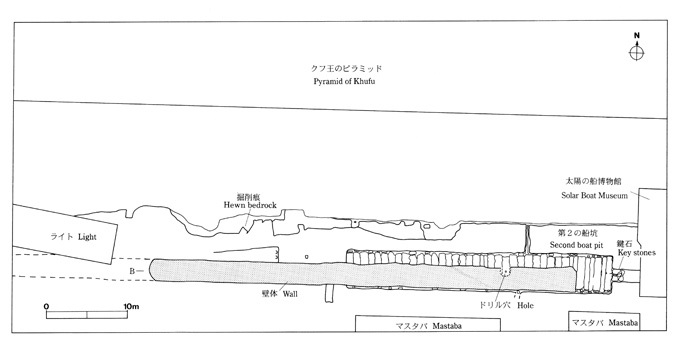 In 1954, two series of large limestone blocks were found in the east and west of the south side of the Great Pyramid of King Khufu at Giza plateau. As for the eastern stone blocks, an investigation was carried out and a large pit engraved in the bedrock containing many wooden pieces of the large boat was found under the stone blocks. The Antiquities Department of Egypt lifted up all eastern stone blocks with manual winches and finished to lift up 41 stone blocks, whose average weight is about 14 tons, and some key stones at the western end oｆ the pit. The record mentions these wooden pieces were amazingly strong and looked like being put there just one year before. After picking up all wooden pieces, the chief restorer of Antiquities Department of Egypt, Mr. Ahmad Youssef Moustafa, assembled them. After spending 13 years and trying 5 times of assembling, he achieved to restore the original shape of the boat in 1971. And, in 1982, upon completion of the construction of Solar Boat Museum, the boat was exhibited to the public. In 1986, 4 years after the opening of the Museum, then Director General of Egyptian Antiquities Organization, Dr. Ahmad Kadry , asked us to join the international team for surveying with high technology. In 1987, a survey was conducted using electromagnetic radar and as a result another boat pit hewn in the bed rock was detected in the area to the west of the first boat. Following this result, four seasons of preliminary investigations were conducted in 1992 and 1993. It was in 2008, however, that the work was resumed for various reasons. 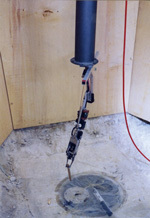 The composition of the air collected from the boat pit is almost same as that of the air outside. The species of the wood was identified to Cedrus libani Loud or allied species. The condition of the wood is much worse than sound Lebanon Cedar. 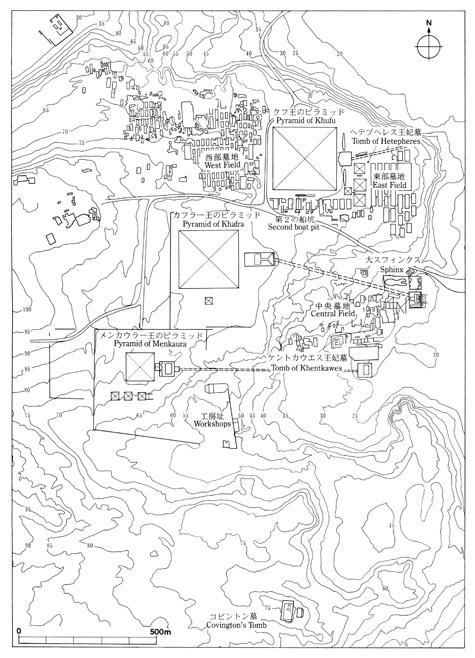 ※For the chronology, referring to Baines, J. and Malek, J., Atlas of Ancient Egypt, Oxford and New York, 1980. 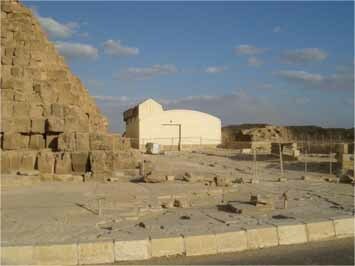 In 2008, the project resumed with new prospects for the consistent founds, and until now (as of July, 2010) the preparation of the facilities, equipments has been done for the excavation, conservation and assembling of the boat. 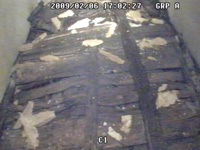 First of all, the observation inside the boat pit with CCD video camera and thermometer was carried out, because 15 years have passed from the last survey. And the opening ceremony of this project was held at the site with attencance of attending Dr. Zahi Hawass, Director General of Supreme Council of Antiquities (SCA). At present, a tent warehouse　of 20m (width) X 44m (length) X 10m (max. height) was erected for enclosing and protecting the working area. The air-conditioners and humidifiers for controlling the temperature and humidity inside the pit after opening the cover stones were also being prepared at the site.